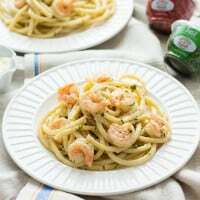 This shrimp linguine with lemon butter cream sauce incorporates the vibrant flavors of summer and comes together in just 15 minutes. Summer is the season for simple dishes that highlight fresh, seasonal ingredients. It’s also the season for meals that require very little effort and come together quickly. There’s nothing worse than having to turn on your oven when it’s roasting outside. I tend to reach for seafood in the summer. It’s fresh, healthy, and easy to prepare. Shrimp is one of my go-to ingredients in the summer. You can pretty much add it to anything and it will taste amazing. We’re big on lemon butter sauce in my house. My husband requests mahi mahi drizzled with lemon butter (more like swimming in lemon butter) at least once a week. While I love lemon butter sauce, eating the same dish again and again gets old, fast! Good lemon butter sauce must include the following items: lemon (obviously), real butter (no margarine–absolutely none! ), garlic, basil, and chili pepper flakes. Five simple ingredients is all it takes to produce one delicious, and versatile, sauce. I adore fresh herbs, but I’m known to let them die before I ever get use them for their intended purpose. They end up wilting and withering to a black pulp before I remember they exist. There’s no need to worry about herbs dying an expensive death with Gourmet Garden‘s new line of Lightly Dried Herbs. All five varieties is the closest thing to fresh in flavor, aroma, and appearance. Once opened, they’ll last up to 4 weeks in the refrigerator. I’d like to think Gourmet Garden had me in mind when they developed their new lightly dried line of herbs. I used their Lightly Dried Basil and Chili Pepper in this recipe. The chili pepper flakes add a subtle spice to the sauce, while the basil gives a fresh burst of summer flavor. The best part about this dish is that it comes together in 15 minutes, from start to finish. This dish has all the flavor of a dish that took hours to cook, minus the labor. Now you’ll have more time to enjoy the weather. Fresh flavors of lemon and basil mingle with butter and shrimp for a hearty pasta dish that comes together in just 15 minutes. Cook pasta according to package instructions, reserving a 1/3 cup of the pasta liquid. While the pasta is cooking, melt the butter in a large skillet over medium heat. Add the garlic, chili pepper flakes, and shrimp to the pan. Season with a pinch of salt and pepper. Cook, stirring occasionally for five minutes, or until the shrimp is pink. Stir in the lemon juice, lemon zest, heavy cream, and reserved pasta liquid. Allow the mixture to simmer for 2 minutes. Drain the cooked pasta and add it to the sauté pan; stir to combine. Cook for an additional minute to allow the pasta to soak up the sauce. Stir in Parmesan cheese and basil. Season with salt and pepper to taste. Remove the pan from the heat and allow the pasta to sit for 5 minutes to thicken. Serve with extra Parmesan cheese, if desired. I love easy pasta dishes and the lightly dried herbs go perfectly. I’ve been using them non-stop! I’m a huge fan of lemon butter sauce, shrimp, and easy meals so I’d say you have a winner here!! I haven’t tried the lightly dried chili flakes yet, but I looooove the basil! I am anxious to try this delicious looking recipe. My husband loves anything made with shrimp and I love pasta, it is the Italian born in me! Your recipe calls for linguini but from the photograph it appears you used Buccatini. The Buccatini would soak up the lovely butter sauce nicely! It’s an understatement to say how much I love shrimp. In fact, I have 3 new shrimp recipes on my blog calendar for June alone. Like you said, who wants to turn the oven on in summer when you can easily have meals like this in 15 minutes? Jennie this pasta looks so creamy and light! The sauce really is luscious. I have been making more shrimp recipes lately and this one will undoubtedly land on the list too! Gourmet Garden is just the best. I’m obsessed with their lemongrass, garlic and ginger paste tube things, I need to get on this dried spice wagon now too! Loving how easy and quick this pasta is! I’m a huge fan of Gourmet Garden!! The basil and the garlic are ones I have on hand ALWAYS! Oh, lemon butter. You make my summer dinner dreams come true. And what’s funny is that I made my Dad a birthday dinner yesterday – grilled scallops with lemon butter – with Gourmet Garden garlic and chili flakes! Completely coincidental / completely awesome. I just love a good seafood pasta, and your photos of this one are absolutely gorgeous, Jennie! Lemon, butter, shrimp, pasta. It’s the perfect meal. Plus those herbs are meant for me too. I’ve been using them like crazy, I love just opening it up and sprinkling away! This was looking and smelling scrumptious until I added the cream and it curdled! Confession: I used half and half because I already had some in the fridge. Did that cause the curdling! ?